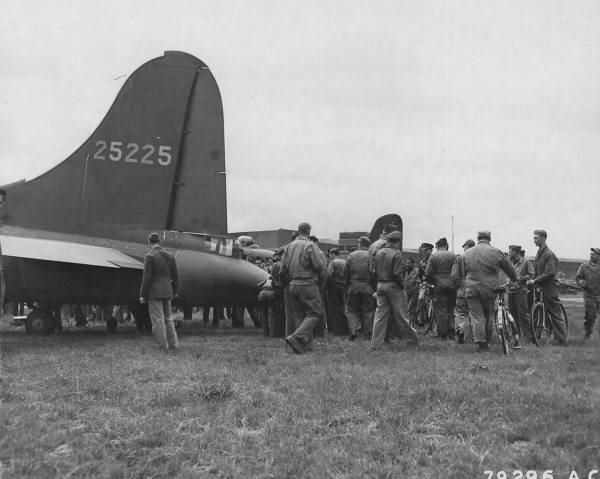 Delivered Tulsa 14/10/42; West Palm Beach 15/1/43; Assigned 323BS/91BG [OR-S] Bassingbourn 8/2/43 as STORMY WEATHER; battle damaged Hamm 4/3/43 with George Birdsong, crash landed base, when repaired was re-named; Missing in Action Schweinfurt 17/8/43; enemy aircraft, crashed Baelen, six miles W of Leopoldsburg, Bel. Missing Air Crew Report 280. V-PACKETTE. BOMB 2LT Walter S. Brown, Jr. POW EVD-arrived home next day?